Kate Woodcroft, QC (41) is a barrister with an outstanding record. Kate has devoted herself entirely to her career at The Bar, to the exclusion of husband and children. She is a workhorse, whip-smart, detail-oriented, disciplined, canny, and nearly fanatical in her pursuit of justice. Her clerk brings her a high profile case on December 2, 2016 which literally is life-changing. Sophie Whitehouse (42) is happily married to James Whitehouse, a politician, a junior Home Office minister, who is a very close friend of the Prime Minister Tom Southern. Sophie and James have two children, Emily (9) and Toby (6), and the family resides in tony North Kensington. Sophie feels fortunate to be married to James, who owes much of his success to his beauty and charisma. Their life is idyllic--until James is accused of a crime. 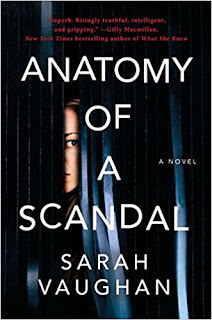 Sarah Vaughan's debut thriller is brilliant on every level. Vaughan's talented writing resounds on every page. The story is enthralling, both classic and timely as it hinges on politics and sexual misconduct, men and women, marriage, choices and privilege. The plot revelations occur at exactly the perfect points and not easily sussed out. The pace is perfection. With a vast gift for depicting both the fallibility and the strength of her characters, Vaughan brings them to life. The dialogue and the interior monologues are authentic. Characters experience trauma and behave in its aftermath in ways which are genuine and believable. The book is written with multiple points of view with chapters from different characters' perspectives. Only Kate's are written in the first person. The story switches seamlessly back and forth from the present (2016/2017) and the past (1992/1993). The author offers us a look into the world of English privilege by following a few young students at Oxford. Some first year students are from generation after generation of upper class breeding and old money. Others are making their way to a better life obtaining that place at Oxford. No student is immune from the pleasures there, whether scholarly, social, athletic, sexual or bacchanalian. Youthful "indiscretions" sow the seeds for present-day impropriety, disgrace, and revenge. 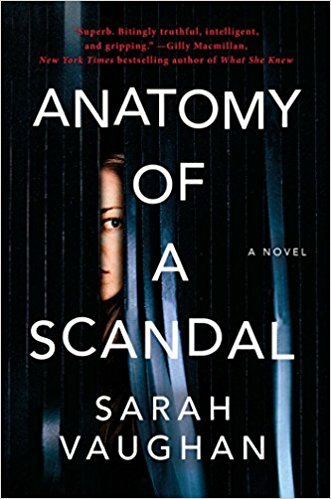 Anatomy of a Scandal is the genuine article, a page-turner which will take you on an incredible, emotionally wrought, and satisfying journey. You will be entertained and you will think about your own suppositions about power, privilege, sexual abuse and justice. This novel already is a bestseller in the U.K., and certainly shall be in the U.S. (and worldwide). The question of a screen adaptation is a "when" not an "if." Kate, Sophie and James each are characters which would showcase actors to their best advantage. I look forward to reading Sarah Vaughan's next thriller with great excitement and anticipation. Thank you to the publisher for allowing me to read a digital copy through NetGalley.